Cloakroom bathrooms can be tricky to get right. Space is at a premium, so it’s important to choose a suite that will work with your room and complement its style. At VictoriaPlum.com we have a great range of cloakroom suites available, giving you a wide choice of designs and styles so you’re sure to find the perfect suite to fit your space. How can I make the most of the space available? We’ve designed our cloakroom suites with space in mind so you can fit a compact bathroom under the stairs or in the smallest of pantries. Here’s some tips for getting the most out of your space. A great way to save on cloakroom space is to choose a wall hung toilet or basin. They’re incredibly compact in their design and create a minimalist look that leaves space underneath for easier cleaning and a roomier feel. Back to Wall toilets are designed so the toilet bowl is separate from the cistern. A great way to save space is to build the cistern into the wall, which will allow for a lot more foot room around the toilet. Another great way to save space is to choose a corner basin. This unit uses very little floor space, opens up the centre of the room and can be tucked tidily into the corner of your room. A great example of efficient space saving furniture is the White cloakroom corner unit. Featuring an integral basin, it is elegant and simple, yet is designed to be very practical and space-efficient. Corner fitting basins and toilets provide a clever solution by using up the corners of your bathroom, making the maximum use of space. By freeing up some additional wall space, it could also allow you to fit in a handy storage unit. What types of styles work well in a cloakroom bathroom? There’s more choice than you might think when it comes to choosing a style for your cloakroom bathroom. If traditional bathrooms are more your style, you can still enjoy a perfectly designed and space-saving cloakroom suite. VictoriaPlum.com has plenty of traditional suite designs that are perfectly compact for any cloakroom. 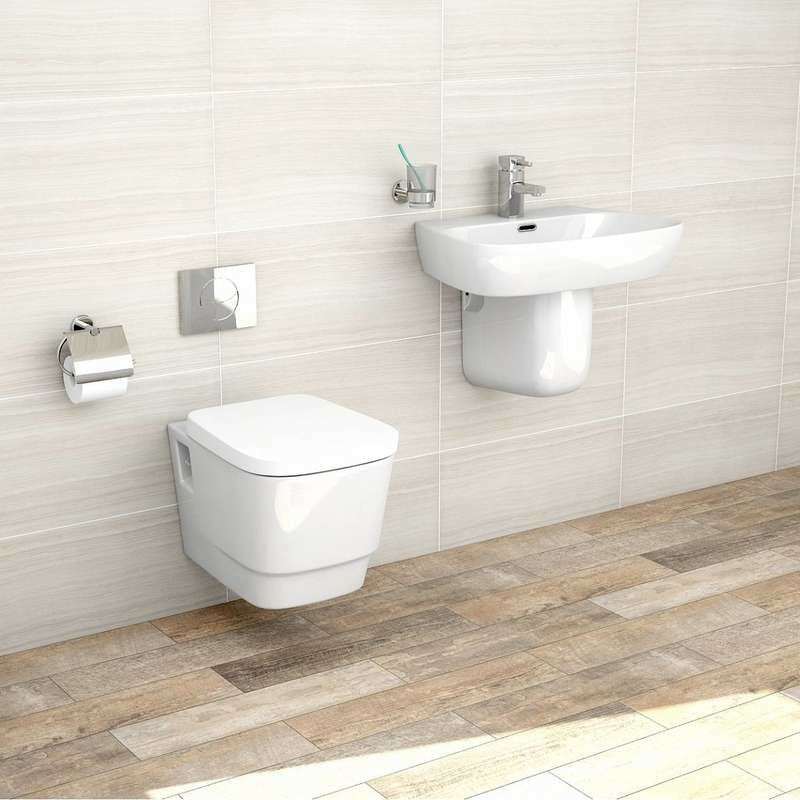 If you’re after a pedestal basin and close-coupled toilet, for example, there are lots to choose from, and you can mix and match units from different ranges to get exactly the look you want. If you’re looking for cutting edge design and modern style then our contemporary suites suit your needs. Contemporary styled furniture contains sleek angular edges and looks great finished with contemporary metallic or chrome taps. 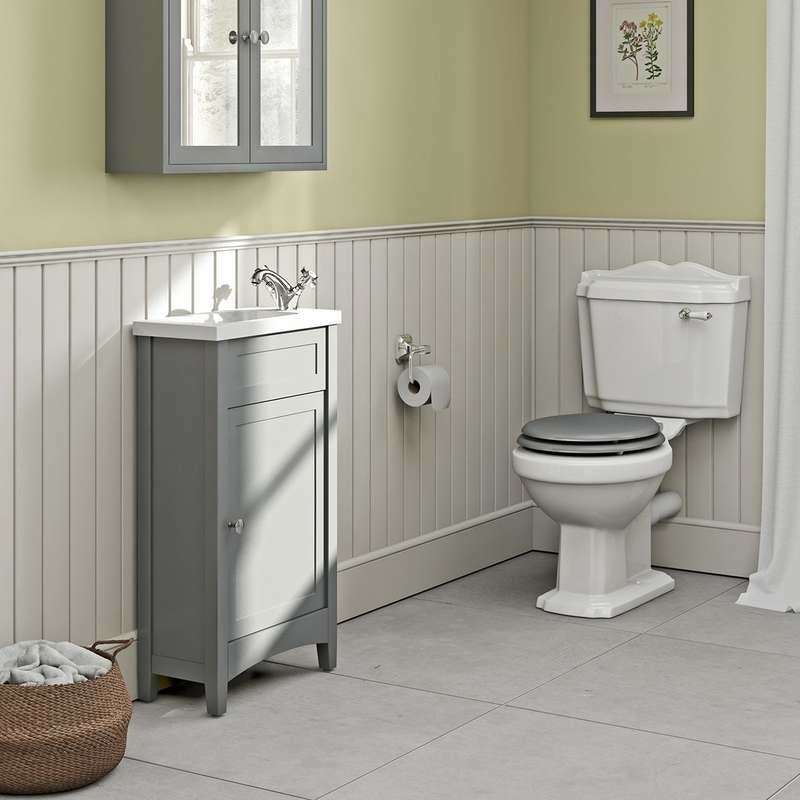 The Princeton wall hung toilet suite (pictured below) is a great example of an on-trend design that’s ideal for a cloakroom. 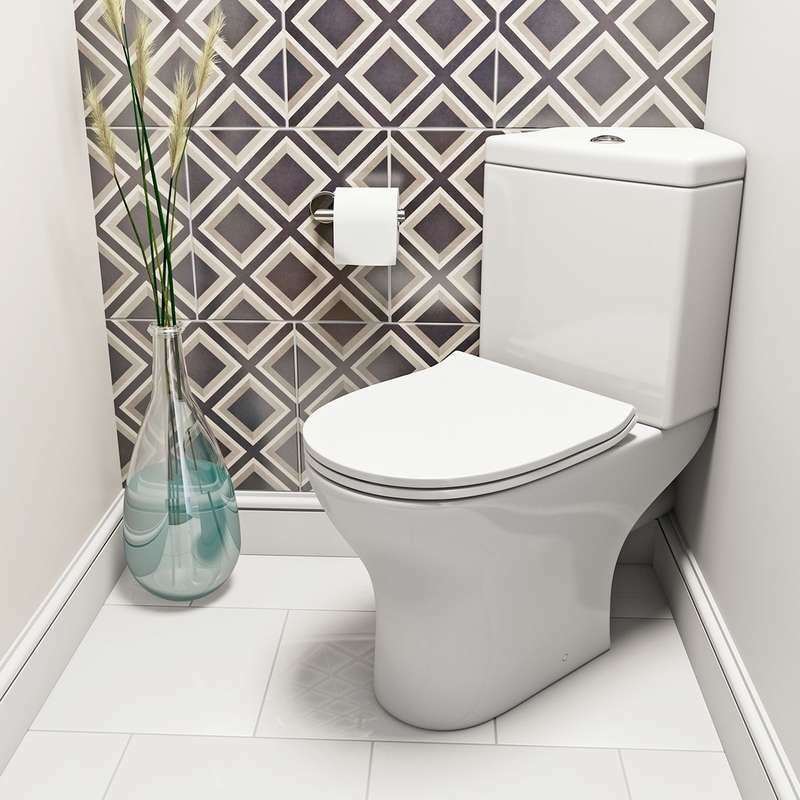 The wall hung toilet is contemporary and neatly designed, with the cistern concealed from view for a clean look, whilst the semi pedestal basin hides unsightly pipework, but keeps your floorspace clear. At VictoriaPlum.com, our range of cloakroom suites provides something for everybody, no matter what style you’re after, or how small your space is. 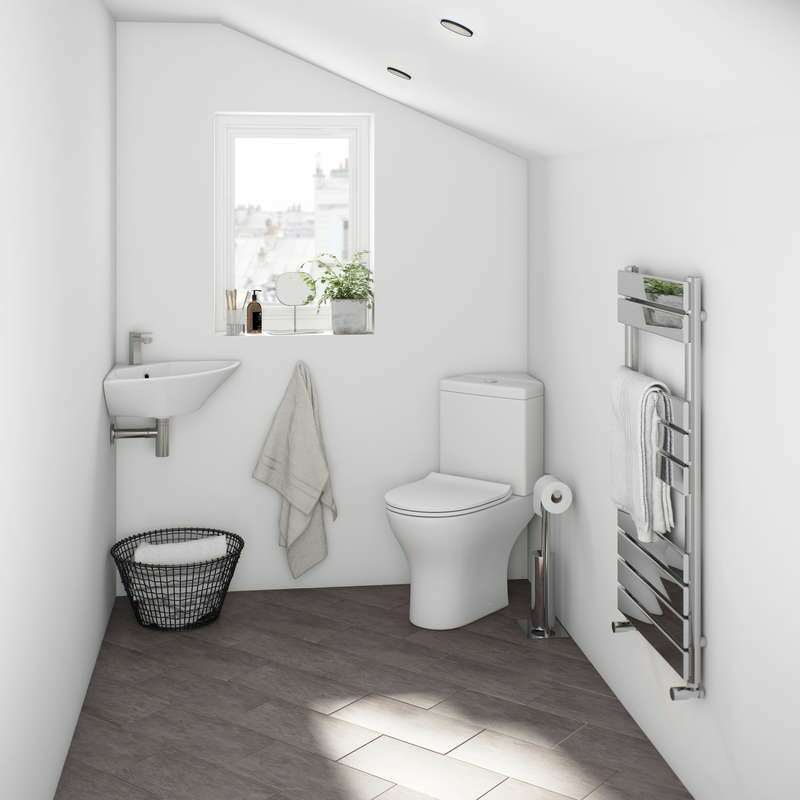 Have a look at our full range to get inspired about converting your cloakroom bathroom into a fully functional and stylish space. Decorating in a small space can be difficult, as balancing furniture and colour choices become trickier. In this planning guide, we'll show you what you need to consider when refurbishing or renovating your cloakroom. When buying a basin for your cloakroom, a compact size doesn't mean compromising on style. In this handy guide, we'll take you through your options.